Motivating Scouts. From Scouts’ points of view, troop meetings are chances for them to get together with their Patrol friends for fun and adventure. For the Scoutmaster, meetings offer opportunities for Scouts to learn, advance, learn new leadership skills, and improve themselves. Strengthening Patrols. Patrols have opportunities at troop meetings to meet together, to learn as a team, and to share what they know. Whether they serve as the honor guard for the meeting’s opening ceremony, or as presenters of a Scouting skill, or as the organizers of the weekly inter-patrol game or activity, every patrol can contribute to every troop meeting. Learning & Practicing Scouting Skills. 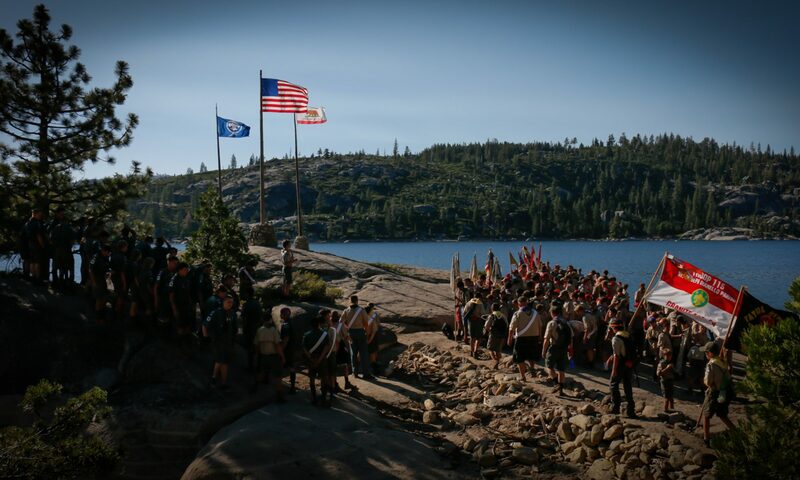 A portion of every Troop meeting is focused on the demonstration and practice of skills that will enhance Scouts’ ability to hike and camp, and to meet advancement requirements. Exercising Leadership. Every week, the Troop’s youth leaders take charge of planning, carrying out, and then assessing the success of their troop meetings. Leadership can be learned only by experience, and troop meetings are the venue for this to happen. Promoting Scout spirit. Troop meetings offer ideal settings for Patrols to take part in contests and competitions that test their expertise and their abilities to cooperate with one another. And meetings always end with the Scoutmaster’s Minute. The committee uses Troop meetings to further its own purposes and goals, including conducting boards of review for Scouts who have completed rank requirements for advancement, and reaching out to new Troop parents, getting to know them, and inviting them to attend committee meetings – This is essential to maintaining the vitality of the Troop. In Troop meetings, the Scoutmaster can observe the youth leaders in action so that, in separate conferences with them, they can be coached on how to improve and refine their leadership skills. Troop meetings are also a time and place for conferencing with Scouts who are advancing, and those who aren’t. Finally, each week the Scoutmaster has the opportunity to “teach a new lesson” in Scout Spirit via the Scoutmaster’s Minute. Responsibility for the conduct and content of a Troop meeting falls to the Scouts themselves. Troop meetings are planned well in advance by the Senior Patrol Leader and the PLC. Each Troop meeting will have been planned the previous month at the meeting of the PLC. The Senior Patrol Leader will have assigned Patrols and individuals to take care of portions of a meeting, giving as many Scouts as possible the chance to contribute. The seven-part Troop meeting plan provides the framework for efficient, well-run troop meetings. The seven-part plan for Troop meetings is an important guide, but use it flexibly. While the seven parts of the meeting are to be followed, the times noted in the plan are suggestions only and can vary to fit various situations. For example, the Troop may be getting ready for a camp-out. The usual amount of time set aside for Patrol meetings might be expanded to allow Scouts time to complete their patrol camping preparations. Or, a troop nearing the date of a District Camporee may devote extra time to skills instruction so that everyone will be ready for activities involving the theme of the camporee, and the inter-patrol activity can include an extended competition that also focuses on the key skills. When the minutes allotted to one part of the Troop meeting plan increase, consider shortening other portions of the plan. Every Troop meeting should be interesting and useful, and begin and end on time. As Scouts begin to arrive for a Troop meeting, a Patrol Leader or an older Scout assigned by the SPL gets them involved in a pre-opening game or project designed so that additional Scouts can join in as they show up. The pre-opening is often well-suited for the outdoors. Those in charge of the pre-opening activity should be ready to start about 15 minutes before the scheduled beginning of the meeting. Varying activities from week to week will keep the pre-opening fresh. Scouts whose Patrol has been assigned to serve that week as the service Patrol should use the pre-opening time to prepare for the troop meeting. The meeting room may need to be rearranged, chairs set up, flags displayed, and other preparations completed before the meeting can begin. Call the meeting to order on time, the SPL instructs his PLs to line up their patrols in formation. Then, the Patrol responsible for the opening ceremony may conduct a flag ceremony and then lead the Troop members in the Scout Oath and Law, Motto, patrol attendance (with Patrol yells! ), etc. Each instructional area should be separated from the others so that distractions are minimized. At the end of the skills instruction, the SPL asks the PLs to take their patrols to their areas for their patrol meetings. Matters to be dealt with during this time include taking attendance, (sometimes) collecting dues, planning the Patrol’s involvement in upcoming troop activities, selecting menus for hikes and campouts, assigning patrol members to specific tasks, and working out any other details for the smooth operation of the patrol. The SPL circulates amongst the patrol meetings, ready to serve as a resource if a PL asks for assistance. Once the patrols have completed their work, the SPL has the PLs bring their patrols back together, and they move on to the next part of the troop meeting. The SPL (or someone he appoints) leads this opportunity for the patrols and their members to interact with one another in a competitive or a cooperative effort. The activity might be a game that will test the skills the Scouts are learning for an upcoming activity—pitching tents or tying knots, for example. The BSA books, Troop Program Resources have a wealth of games to foster friendly teamwork and competition. The BSA manual, Project COPE (No. 34371), also contains many appropriate games and challenges. The closing of a meeting is the Scoutmaster’s opportunity to step forward—this is actually the only time he appears before the entire troop in a regular troop meeting! The SPL asks his PLs to sit their patrols quietly, then he turns the meeting over to the Scoutmaster for (brief!) reminders and announcements about upcoming events, and support of the patrols for their achievements and progress. The highlight of the closing will be the “Scoutmaster’s Minute”—a brief message built on one of Scouting’s values. As the concluding thought of a troop meeting, the Scoutmaster’s Minute is a message each Scout can carry home. Here, the PLCs’ stays a few moments after the closing to discuss with their SPL and Scoutmaster the quality of the just-concluded meeting. The SPL offers praise for portions of the meeting that went well, and talks about ways that future troop meetings can be improved. The Scoutmaster offers commentary only when called upon by the SPL. What should we not do again? Did we accomplish a purpose? Did we do something new and different? Did we have all the resources necessary to accomplish tasks? What worked well that we should do again? Finally, the PLC reviews the Troop Meeting Plan for the next meeting and makes sure that everyone who will have a role is aware of the assignment and is prepared to do a good job. While the PLC is reviewing the meeting, the Service Patrol is putting away Troop gear and returning the meeting room to order. Prior to the meeting, review the Troop meeting plan with the Scoutmaster. Keep the meeting moving. if the proceedings of one part of the meeting seem to have run out of energy, move on to the next. Take charge of the meeting. Scouts will follow your lead. Stay focused on the program feature of the month. When you are ready to move from one part of the meeting to the next, use the Scout sign to gain the attention of all troop members. Praise Patrols when they have done something well. Set a good example by wearing your BSA uniform to Troop meetings. When Patrol members are watching, be supportive and positive in your comments to Patrol leaders, if you feel the need for constructive criticism, speak with Patrol leaders in private. End every meeting on time. Review each meeting to see what can be improved in the future. Don’t wear out favorite pre-opening or inter-patrol games and activities. Try new challenges. Troop meetings must have variety, action, and purpose. Variety. Don’t get in the same old rut. Help the senior Patrol leader mix in surprises now and then–a special visitor, for example, a fresh activity, or perhaps a chance for the Troop to make homemade ice cream. Keep a file of resources and ideas that can add spice to meetings. Action. Boys spend much of their day sitting in school. Get them out of their chairs at troop meetings. Tenderfoot, Second Class, and First Class Scouts should be involved in learning basic Scout skills. Keep in mind that all Scouts, regardless of their age or experience level, should be active participants, not just observers. Purpose. Troop meetings should be built around a purpose; for example, helping Scouts prepare for an upcoming activity or event. Many meetings can and should take place outdoors. The Patrol that was assigned the previous week to be this week’s service Patrol should arrive early enough to prepare the room or outdoor area for the troop meeting. At the end of the meeting it is the service Patrol’s responsibility to put everything away and return the meeting space to its original condition. The SPL is in charge of every Troop meeting. Help him plan ahead, coach him along the way, but stay in the background and let him be the leader. Encourage the SPL to start and end meetings on time–90 minutes is the ideal. You and the youth leaders can use the Scout sign any time the Troop must come to order, especially when shifting from one part of a meeting to another. Keep it effective by using it sparingly. Don’t wear out activities the Scouts enjoy. If the Troop has a favorite game, keep things lively by alternating it with other games now and then rather than relying on the same one every week. During the planning stages of skills instruction, remind instructors that demonstrations are most persuasive when they show rather than simply tell. If a troop instructor is going to explain how to load and carry a backpack, he should bring the gear and the pack to the meeting. Hands-on. experience is an especially effective method of teaching. Coach instructors on the importance of involving Scouts as participants in skills instruction, not simply observers. Plan ahead. Will a Patrol need a plant identification book for nature study? Will each Scout need a length of rope to learn a new knot? Instructors should get in the habit of gathering their materials ahead of time. Keep the length of the Scoutmaster’s Minute to not much more than just that-a minute. Just as you ask youth leaders to plan well for efficient meetings, give some thought ahead of time to how you’ll manage the meeting’s close. End the meeting on time. Leave the boys wanting more and they will be eager to return the next week. Unless they’re been invited to take part in a specific part of a meeting, visitors should be observers only. Don’t allow them to disrupt the flow of events. The recognition and encouragement Scouts receive from their Scoutmaster is a crucial part of their development. At every meeting find something positive to praise about each Patrol–well planned presentations, proper uniforming, a good opening ceremony, or even something as simple as arriving on time. Support youth leaders in a positive manner during meetings. If you feel the need to correct or criticize, save your thoughts until after the meeting and then find a productive way of teaching boy leaders how to be more effective.